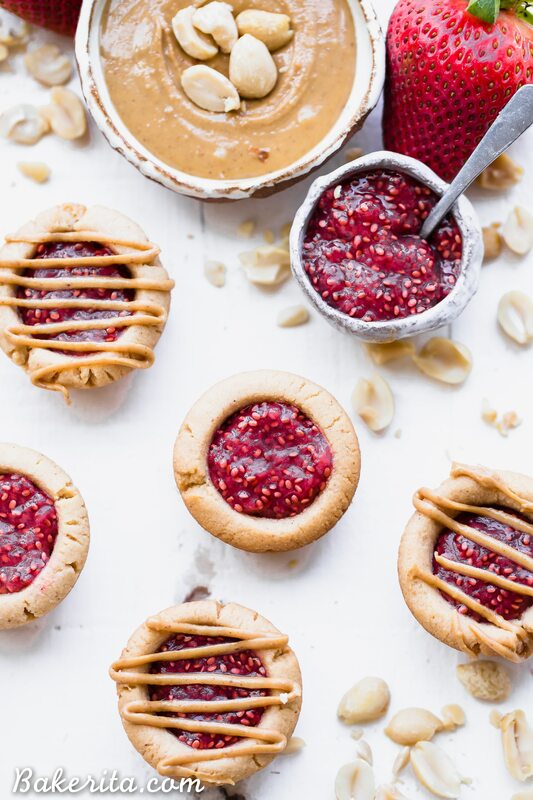 These Peanut Butter & Jelly Tartlets are made with just SEVEN ingredients! 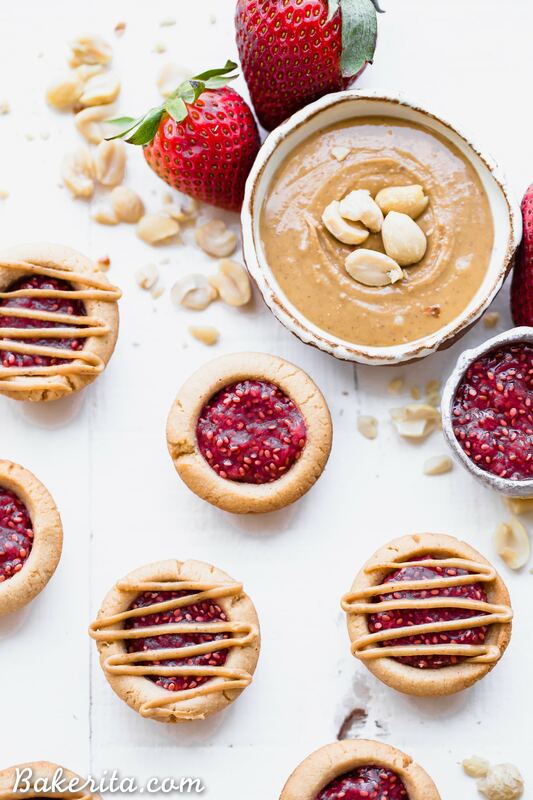 They have a crunchy peanut butter cookie crust, filled with an easy strawberry chia jam and topped with even more peanut butter. 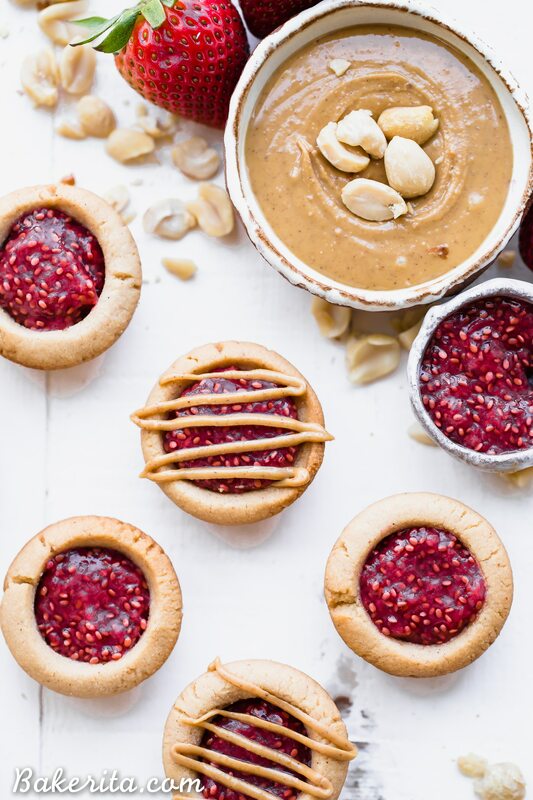 These gluten-free, grain-free, and vegan tartlets are as cute as they are delicious! Phew, it’s Wednesday evening, around 4:30 pm as I write this, and I feel like this is the first work I’ve done all week…#slacker. Of course, I actually have done some stuff – I had a MAJOR recipe testing day on Monday, but most of them were fails, sooo, not much progress. Yesterday, I went over to my girl Monica’s house, who runs the food blog The Movement Menu. Her and her husband just moved, so I went over to see their new house with Hank, who spent the day chewing through one of their rugs and exploring their backyard, while Monica and I chatted and I organized her prop shelf in her office. I’m a weirdo who LOVES to organize, so I had a blast stacking plates and organizing her beautiful pottery. And then this morning, I got up all my courage to try my first Soulcycle class as part of an event organized by my friend Lindsay from Weeknight Bite (who I’ve actually known my ENTIRE life because our parents are friends). It was actually so fun, but let’s be real, I was just doing it to get to the poke bowls from Sweetfin after the cycling, which were drool-worthy. My week has felt more like a weekend – this is why I LOVE MY JOB. Seriously, so blessed. 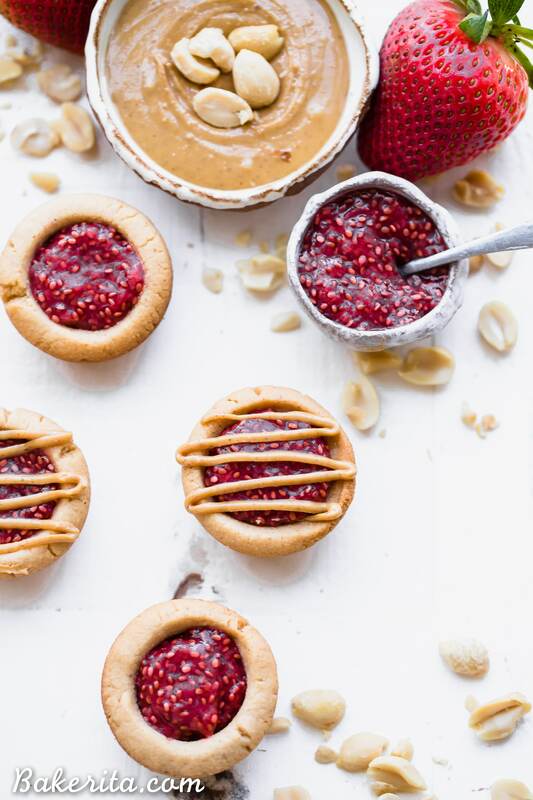 Especially because the next part of my job is talking about delicious desserts, and explaining why YOU should make these adorable little Peanut Butter & Jelly Tartlets. Aren’t they swoon-worthy?! 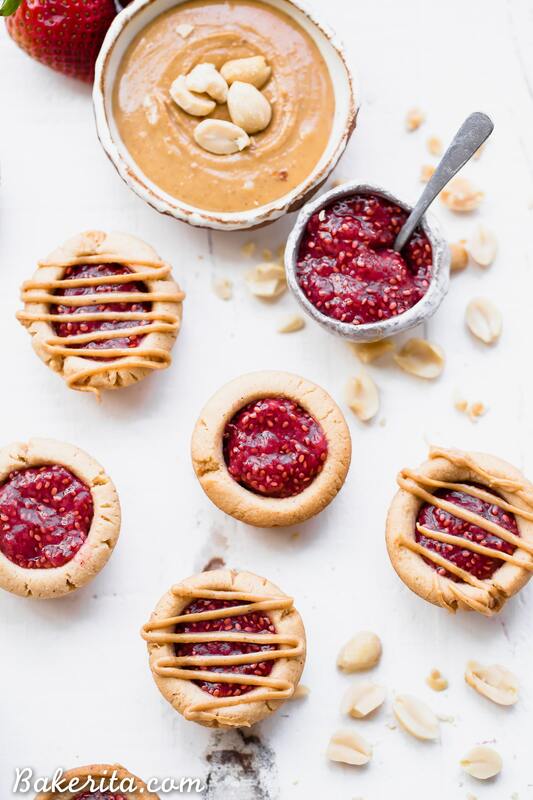 Let’s talk Peanut Butter & Jelly Tartlets! These little guys are so simple, and so delicious, which is my favorite combo of features in a dessert. We do have to make two different things, the crust dough and the chia jam, but they’re both SO EASY that I promise you won’t mind. The dough is up first, so it can chillll while we make the (super easy) chia jam. The crusts consist of just peanut butter, coconut oil, maple syrup, coconut flour, and salt. That’s all, folks! Just stir everything together and let it hang out in the fridge for a little while. Meanwhile, for the chia jam, we just need a few things: strawberries (fresh or frozen will work! ), maple syrup, and some chia seeds. That’s right – only seven ingredients needed, TOTAL. Told you these were easy. The jam is made super simply in the microwave – it just takes 2-3 minutes. Once the crusts are baked, you fill with jam, and top with an extra drizzle of peanut butter. If you want, you can cover the whole top in peanut butter and then get a little jam surprise when you bite into the tartlet…sooo good! Grease a 24-cavity mini muffin pan with coconut oil. Combine the peanut butter, coconut oil, and maple syrup in a small mixing bowl. Stir to combine and then mix in the coconut flour and salt until a smooth dough forms. Place in the refrigerator for at least 30 minutes. While the dough sets, make the jam. If you're using fresh berries, mash the berries in a small bowl. Microwave for one minute. If you're using frozen berries, microwave for 2 minutes and then mash the berries up. Stir in the chia seeds. Microwave for one more minute, and then let cool. When you’re ready to bake, preheat the oven to 350ºF. Divide the dough between the 24 mini muffin cavities and press up the sides (For this, I made little dough balls, placed them in each cavity and then used the blunt end of a cocktail muddler to press into the crusts - makes it way easier!). Bake for 9 minutes for a softer crust, or up to 12 minutes for a firmer, crunchy crust. Let cool completely before using a toothpick or knife to pop the cups out of the muffin tin. After the crusts cool, place about 1 tablespoon of the jam in each crust and then drizzle with more peanut butter. Thanks Rebecca, hope you love them!! I always use 100% peanut butter with nothing in it except peanuts, and it’s always pretty running! My favorite brands are Crazy Richard’s and Spread The Love. You can use almond butter too, just choose one made with almonds only! Step number five seems random… whats it for? Was a mistake on my part! It’s fixed now. I made these but substituted the maple syrup for agave nectar. They came out incredible sweet and seem to have risen a lot as I can’t get much jam in. Help!! Hi Sarina, I find agave to taste sweeter than maple syrup, so that makes sense. As for them puffing up, you can press the bottoms back down while they’re cooling to create more space, using your fingers or a tool like I used. Hope this helps, and sorry for your trouble. These were so delicious! My family loved them. Thanks for the recipe! So happy they were a hit! Thanks Tracey. I tried making these and everything tasted good but my dough was extremely crumbly after I baked them. The batter seemed smooth before I put it in the fridge, but when trying to place the dough into the muffin tin it had a hard time sticking together. Any suggestions? Less coconut flour? Not enough coconut oil? Hi Kat, how odd! Obviously, the stated ratios are what worked best for me…my dough was pretty soft which is why I put it in the fridge, but if yours seemed firm enough before refrigeration, you can just skip that step. Hope they’re still tasty! These love okay great! If I use ready-made jam, how much should I use? Just use enough to fill up each of the cups! Not sure exactly how much you’ll need.